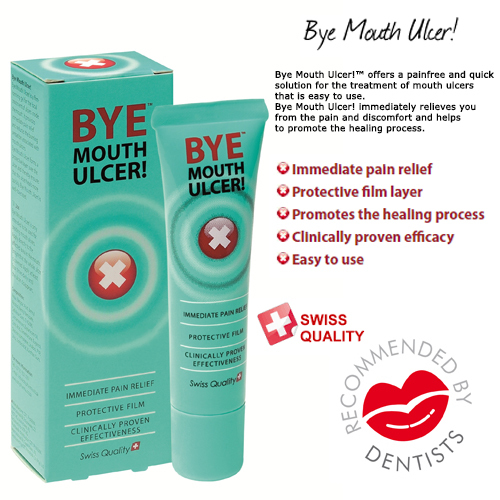 Bye Mouth Ulcer!™ is a patented product that uses the ingredient Dimethicontoto form a protective, breathable layer over the mouth ulcer, which relieves the pain immediately and stimulates the healing process. The mouth ulcer is then completely sealed and the active ingredients along with the restorative properties of the mouth ensure that the mouth ulcer will heal and disappear more quickly. Pain is relieved, the number and size of the mouth ulcers reduces and the healing process is boosted. Use Bye Mouth Ulcer!™ at least 4x per day until the ulcer has completelydisappeared. Use at least 30 minutes before and/or immediately after a meal. Use in the evening after brushing your teeth and/or before you go to bed. Do not apply the tube directly on the ulcer, to prevent the product from getting infected.